Nigerian Senate on Wednesday amended a section of the constitution to restrict a vice president or deputy governor who serves out the tenure of his or her principal in office, in the event of death or permanent incapacitation, to one fresh term of four years. The bill tagged, “Restriction of tenure of the president and governor Bill’ garnered 88 votes when it was considered. The Bill seeks to restrict a person who was sworn in as president or governor to complete the term of the elected president/governor from contesting for the same office for more than one term. However, despite calls from various ethnic, religious and political leaders that the country should be restructured, the Senate rejected the Devolution of Powers Bill. Using electronic voting, and with 46 for and 48 against, Senators voted against the proposal, which had been challenged on Tuesday by Adamu Aliero, who argued it should not stand without reviewing the revenue sharing formula to give more money to states. If it had succeeded, the Bill would have effectively set restructuring in motion. The bill had sought to alter the Second Schedule, Part I & II to move certain items to the Concurrent Legislative List to give more legislative powers to states. It had also intended to delineate the extent to which the federal legislature and state assemblies could legislate on the items that have been moved to the Concurrent Legislative List. The red chamber threw out the contentious Bill on resource control, voted to abrogate state/local government joint accounts and guarantee existence of democratically constituted councils. It also passed the bills seeking to include former National Assembly presiding officers in the Council of states, to ensure ministerial nominees sent to it include their portfolios and are sent within 30 days of inauguration of the president and of governors for states and for INEC to deregister political parties over failure to secure an elective seat, independent candidacy, abolition of state Independent Electoral Commission and autonomy for state Assemblies. The controversial reduction of age qualification Bill, which was initially rejected by lawmakers during their retreat in Lagos, also scaled the hurdle. On the whole, 29 of the 33 bills that were considered succeeded. Other bills shot down were those on state creation and boundary adjustment, citizenship and indigeneship and Land Use Act. Authorisation of Expenditure Bill, which seeks to alter sections 82 and 122 of the Constitution to reduce the period within which the president or governor may authorise the withdrawal of monies from the consolidated revenue fund in the absence of an appropriation act from six months to three months also got the nod. Also passed were financial autonomy for state legislatures, distributable pool account, local government and the legislature bill. The Senate rejected a clause which had provided a 35 per cent affirmative action for women at the federal level and 20 per cent at the state level. It also passed the political parties and electoral matters, presidential assent, time frame for submitting the names of ministerial or commissioners nominees, appointment of minister from the FCT, change of names of some local government councils, independent candidature and the police bills. If the political parties and electoral matters passes the final hurdle, INEC would have the power to de-register any political party that fails to win any elective office. Bills on the separation of the Office of Accountant-General, Office of the Auditor-General, Separation of the Office of the Attorney-General of the Federation and of the state from the office of the minister or commissioner for justice, judiciary, determination of pre-election matters and civil defence bills were also debated and passed. Similarly, procedure for presidential veto in constitutional alteration, removal of certain Acts from the Constitution, investments and securities tribunal, deletion of the NYSC Decree from the Constitution, deletion of the Public Complaints Commission Act from the Constitution and deletion of state Independent Electoral Commission were considered and passed. The conclusion of the constitution review exercise is coming 19 months after the Senate constituted its Constitution Review Committee, which was headed by the Deputy President of the Senate, Ike Ekweremadu. President of the Senate, Bukola Saraki, who presided, said with the exercise, the upper chamber has laid a solid foundation for future generations. He said with the passage of the amendment bills, issues, which hitherto hampered the development of the country would be resolved. “We have laid the foundation for a far reaching reforms and political developments. We have addressed the issues that have tied us down for many years. We have made provision for compulsory savings. We have made laws to strengthen our anti-corruption laws. We have passed a law to allow our young people to vie for elective offices. We have laid a good foundation for a new Nigeria that will place us among comity of nations. 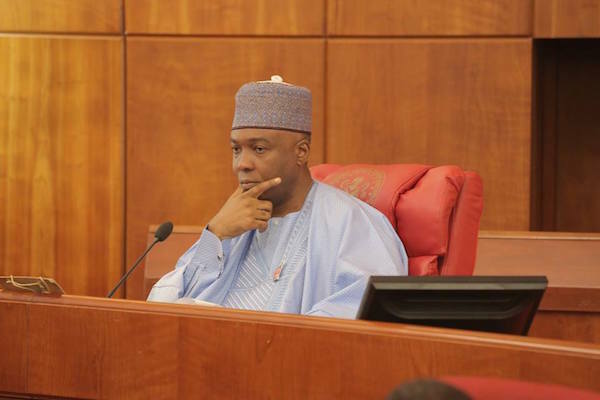 I want to thank you for making the Eight Senate for this history possible,” Saraki said. There are currently 107 senators, including Saraki. Twelve of them did not attend yesterday’s plenary. In all, about 95 senators were present and voted. Suspended former Leader of the Senate, Ali Ndume was not present. Anambra Central Senatorial District is yet to be filled and at the moment, there is representative in the Senate from that area. For any section of the constitution to be amended, two-third majority of 109 senators must vote in the affirmative. For Section 9 of the Constitution to be altered, two-fourth majority of 109 senators must vote as well. These are the procedures adopted in the National Assembly during constitution amendment exercises. As soon as the House of Representatives passes alteration bills and a conference committee meets to harmonise the differences, the document will be sent to the 36 State Houses of Assembly for concurrence.